What a pride knowing that my vote counts too! Posted byDidier Champion	 August 5, 2017 January 20, 2018 Leave a comment on What a pride knowing that my vote counts too! As a 27-year old, this was my 2nd time participating and voting in the Rwandan presidential election. My first time was in August 2010, and my voting station was in Little Rock, AR in the United States. 7-years later, I voted at Kaiserslautern, Germany. There is a sense of pride that comes with casting your vote and knowing that your voice matters as a Rwandan, regardless of your physical location. I cannot describe a sense of belonging I felt knowing that I am one of the first Rwandans, probably in the top 1% to cast their vote for the candidate who is going to be the president of Rwanda for the next 7-years. During my time here on earth, there have been 3-presidential elections. The first one was in August 2013, and back then, I was just a little boy. I was just starting out middle school and could barely understand the seriousness of what was happening. The second election was in August 2010, and I had just finished my first year of college. Although I was mature enough to know what was going on and voted with pride, I don’t think I understood the seriousness that comes with voting and choosing the president of Rwanda as much as I do now. A few days ago, when I voted, I can tell you that for my third election, I understand why I have to vote and what is at stake whenever it comes to voting for the president of Rwanda. Knowing that I am voting for a candidate who is going to lead Rwanda for the next 7-years, and continue to sustain Rwanda economic development in the years to come. Knowing that I am choosing for a candidate who will maintain peace, security, and continue to ensure our nation’s sustainable development. Knowing that I am voting for a leader who will inspire the young generations, lead Rwandans by example, and encourage them to stay united, work together, think big as Rwandans deal with challenges ahead. The only presidential candidate who fulfilled my conditions was none other than President of Rwanda, Paul Kagame. Whether you agree or disagree with him on running his third time, what matters most is he is liked by the majority of Rwandans. He has changed the game. He is a visionary leader, and a great CEO of Rwanda, Inc. Under his leadership, Rwanda has gone from being a failed state, politically and economically to a stable and peaceful country, in what the international community calls an “economic miracle“. The truth is that there was no miracle performed, but simply Rwandans inspired by their leader, who came together to build a new nation, a united and peaceful Rwanda. Basically, when his time was getting close, he was asked by the shareholders ( Rwandan people) to stay and continue to be their CEO ( president). Through a national referendum and a constitutional process that took about two years, the shareholders agreed to extend his term and he graciously accepted the offer to continue leading the company ( country ) again. Whether you agree or disagree with him, there is no question that he is loved by the majority of Rwandans. That is the reason why he was able to attract huge crowds of people and won the election by a landslide ( 98.63% of votes). As a young voter, I am so proud of the participation and the enthusiasm of young voters in this 2017-presidential election. Previously, young voters used neglect voting and would stay home on the election day. But this time, it was different. All of the sudden, voting became a “cool” and “class” act. I was very surprised to see all social media (Facebook, Instagram, and others) filled with photos of young Rwandans showing their ink, proving that they had cast their vote. The hashtags such as #RwandaDecides were trending all over twitter. This is very important and promising for the future of Rwanda. According to the Rwandan National Electoral Commission, 45% of registered voters were young people under 35. In addition, 26% of all voters were first time-voters. The more involved the youth is, the more they grow up paying much attention to what is happening in their country and wanting to become involved and participating in their nation’s building. The Kigali Convention Center, currently the flagship of the nation’s capital. 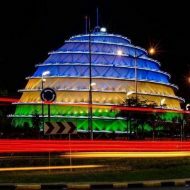 It is a sign that Rwanda is ready for business and represents progress. Kigali-Centre Ville or downtown Kigali. The nation’s capital at night. It never sleeps. Thank you so much for this reading this piece. I hope you have enjoyed it. Consider subscribing to my blog in order to stay up-to-date whenever I publish a new piece. Feel free to share with your friends if you think they would enjoy it too. Until then, much love and respect. Bitcoin: Is Digital Cryptocurrency rising or is it a bubble? Didier Champion, Create a free website or blog at WordPress.com.